We are totally into Designer range fashion jewelry in semi precious stones, natural pearls, silver and exotic beads. 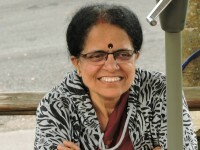 I am Thejovathi Acharya, the designer behind Kaveri Karakushala. Kara(Hand) Kushala(skill), a Kannada word, was chosen to do justice to the skill that goes into crafting handmade artifacts. Kaveri Karakushala is the outcome of passion turned hobby that has gradually evolved into a business. The handmade product range consists of traditional to modern jewellery and gift articles, made using one of a kind high quality materials. The designer brand also caters to custom orders on request. Free shipping is offered to only customers in India. - Exchange Or Return request will be accepted only if damaged or wrong product is delivered to the buyer. In this case the shipping charges will be borne by the seller . - Product once sold will not be taken back owing to color or shade difference, due to photography and difference in screen/monitor resolution . So please allow a little difference in color . - All requests for return of product have to be placed within 24 hours from the date of delivery. - No return requests after 24 hours from delivery will be processed. - All items must have the original tag and label and must be returned in the same conditions as delivered by the Company.